Anyone welcome, all questions taken. No fixed agenda so make the most of things and bring those burning questions & tricky scenarios. We’re also thrilled to announce that courtesy of Plantronics we have a Focus UC to give away live during the meeting. 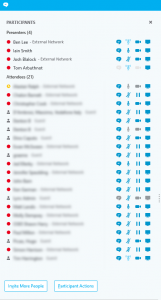 We’ll do a dump of the attendee list towards the end of the call and then randomly (probably using powershell knowing Tom) pick a winner. Feel free to drop us some comments with some topic suggestions or items you would like to have covered.